In Thai, the word ‘Sutai’ means ‘to die before giving up the battle’ this is the core foundation of Sutai Muay Thai. They believe that to become a truly great fighter you not only need strength and technique but you need to have the heart to go all the way. With this ethos in mind, Sutai was set up in 2015 by former Muay Thai champion that had the same passion to succeed. Their main aim is to provide a supportive camp that will enable you to realise your potential, through hard work and dedication. During their 1st year they have sponsored a number of fighters that have seen some great success as a result. They also set up the “Pura Vida” fighting for kids project that helps support 10-14 year old Thai boys to become champions. Sutai offers a traditional Muay Thai experience with 2 rings, plenty of bags and free weights. Their accommodation is quirky and modern, being built out of shipping containers, and offers something for every budget. They also have a great location, ‘smack-bang’ between Bangtao & Surin beach. Taking full advantage of the location with beach training on Saturday morning! 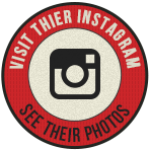 They are in the process of opening a new restaurant to compliment the training and are hoping to open this by the end of October. With a focus on clean, healthy food that will keep you fuelled whilst you train! They have a very welcoming atmosphere at the camp, many of the guests have mentioned they “Love how the gym feels like a family and everyone is so supportive, no matter what level you are.” They are also very multi-cultural, the manager, Mauricio Calvo is from Costa Rica so you are just as likely to hear our guests speaking Spanish as your are to hear Thai or English! 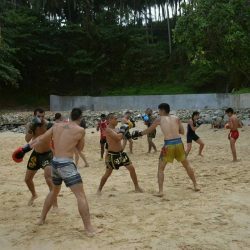 Sutai Muay Thai is only 30 minutes from Phuket International Airport & its located less that 1Km from both Bangtao Beach & Surin Beach 2 of Phuket popular beaches. The gym is also surrounded by local bars & restaurants so you can get a taste of original Thai cuisine. If you have trained at Sutai Muay Thai then please feel free to rate it below, you can do so by clicking on the stars, rating each category between 1 & 5 Stars 1 = Bad 5 = very good. 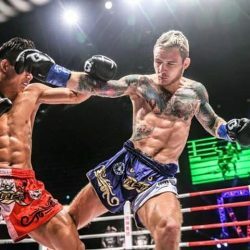 Your average is then calculated & added to the average of all previous votes giving the gym score that can be compared to the other Muay Thai Gyms in Phuket.